Full of vividness and open-minded towards coevals they inspire. Intellectual, practical, inquisitive, literate, sophisticated, open-minded, perceptive, versatile, communicative, quick, curious and decent. Nervous, volatile, restless, dualistic, undetermined, undecided, intrusive, superficial, arrogant, solitary, scheming and vain. Ascendant Gemini discovers the world with incisive cognition and curiosity towards the environment and without prejudice. 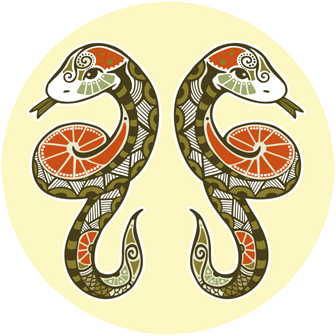 Ascendant Gemini has a profound interest in companions. They are communicative and at a societal level are privileged as eloquent speakers. They invite you to take part in their lives and experiences. Caused by their strong interest in everything that surrounds them Ascendant Gemini seems to be somehow superficial – for a profound view, they have to take a closer look and sometimes time is missing. They are busy with come to know to something new and to gain experiences. They like to remain uncommitted. They tend to avoid firm commitments - from their point of view firm commitments endanger their independence. Their Descendent Sagittarius assists them to process more binding in his lifetime.